If you live and surf in the UK or Ireland and you’re worried about being too warm in the water please don’t fret - our magical isles have a way of ensuring it’s rarely an issue. None the less choosing which wetsuit to buy and which to wear on any given day takes a bit of thought. Bear in mind this table is designed for average seasonal conditions and water temperatures but the air temperature and especially wind chill on any given day make a huge difference. You could be comfortable in a 4mm wetsuit on one winter's day with calm weather, a little sunshine and average air temperatures and freezing cold the next day if the wind gets up, the temperature drops and the cloud covers the sun! 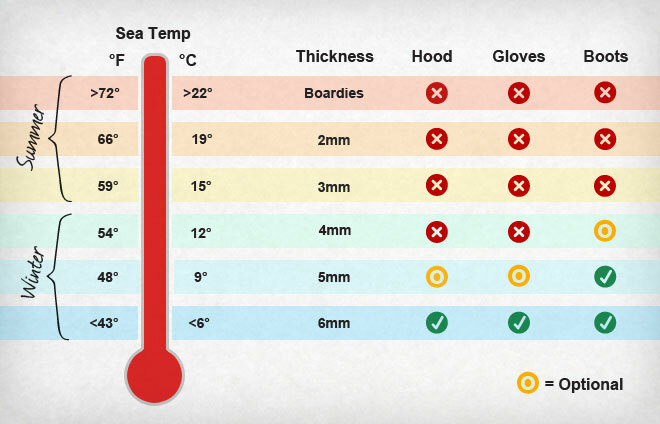 Picking a wetsuit depends on the season but this catches many novice surfers out. Bear in mind the sea heats up very slowly, the sun can be shining and the air warm for a few months before it makes a real difference to sea temperatures, so the wetsuit seasons always run a bit behind the actual season. Spring is cold in the water even when the sun’s shining, a winter wetsuit is worn by many surfers right up until June on a cold year. Once summer comes and the water heats up the warmer temperatures can last right through to the end of October so your summer wetsuit will stay on longer than you might think. The worst winter chill is February when the sea has had time to cool to match the air. Picking a wetsuit also depends hugely on your budget, we can’t all afford the luxury of a wetsuit to match every condition. Get a 3mm, 4mm AND 5mm wetsuit. The lifespan of a wetsuit is directly related to the number of hours it spends in the water so although you’ll put more pounds up front ultimately you’ll need to replace your wetsuits less frequently so long term you’ll spend no more and you’ll always be able to pick a perfect match for the temperature.